elsh history is often looked upon as the struggle carried on by the princes of Gwynedd for liberty from the English crown. What is often forgotten is that until the coming of Llywelyn ab Iorwerth of Gwynedd (or Llywelyn Prince of Aberffraw and Lord of Snowdon as he called himself from 1230) in the early thirteenth century, there were many princely leaders of many houses in south and mid Wales who played great roles in British history. The following narrative tells of some of the exploits of the elder sons of Madog ab Idnerth, a descendant of the old kings of Cynllibiwg. In the Saxon era the forbears of Madog had held precarious sway over the lands of the Upper Severn and intermittently claimed hegemony from Montgomery to Pembroke and Aberystwyth to Abergavenny. At the time of the Norman conquest of England in 1066 the old kingdom of Cynllibiwg seems to have been in abeyance, but during the next 20 years the sons of Cadwgan ab Elystan Glodrydd gradually re-established themselves at the expense of the princes of Deheubarth and Morgannwg. At his untimely death in 1099, King Llywelyn ab Cadwgan was an underking of William Rufus (1087-1100). Llywelyn also issued the only known coins of a Welsh ruler. At King William's mint at Rhydygors (Carmarthen) he struck coins bearing the legend, 'Llywelyn ap Cadwgan, Rex'. After Llywelyn's death the Welsh of Central Wales seem generally to have acknowledged the lordship of various Normans and to have fought well in the continental armies of King Henry I (1100-35). Here the Welsh learned Norman cavalry and infantry tactics which Giraldus Cambrensis states were later to put to good use against the Normans in Wales. 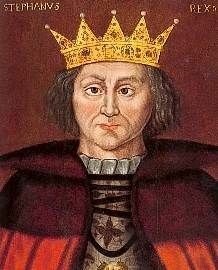 The early years of King Stephen's reign (1135-54) did not auger well for the prosperity of the nation. After repeated uprisings in the peripheries of the realm the Empress Matilda, daughter of King Henry I, landed near Arundel castle at the end of September 1139. The result of her arrival was a premeditated major rebellion in the west of England and civil war throughout the realm. 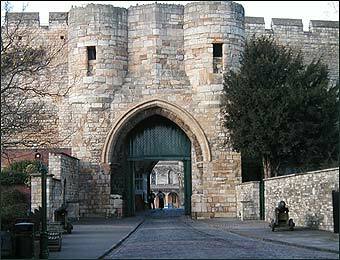 Early in 1141 King Stephen went to Lincoln to try to recover that castle from the earl of Chester. The earl left his brother William Roumare to defend the fortress and slipped away to the south to join Earl Robert of Gloucester and Miles Gloucester in the Marches of Wales. Together these men formed a large army which consisted of a full one third Welshmen and united they marched against the king at Lincoln. The now ancient Ordericus Vitalis, the Chronicler monk born in Shropshire, recorded the resultant battle and stated that the Welsh contingent was led by two princes and brothers, Mariadoth et Kaladrius. The first of these two men was certainly Maredudd and the second may have been a heavily mutated Cadwgan. Both are likely to have been sons of Madog ab Idnerth of Maelienydd and enemies of Hugh Mortimer of Wigmore, the arch royalist in the west. It has previously been held that these two men were Madog ap Maredudd of Powys and his brother in law, Cadwaladr of Gwynedd, both of whom were in contact with the earl of Chester. However, on etymological grounds the identification would seem to rest with Maredudd and Cadwgan, men who had more to gain from service to the Angevin cause. The lands of these two little-known princes of Cynllibiwg (roughly modern Radnorshire) bordered on Earl Miles' land of Brecon and may even have included the northern parts of the shire. Their collusion with the enemies of King Stephen and later events in Central Wales are revealing about what happened in Wales during the Anarchy of King' Stephen's reign (1135-54). It would seem likely that a peace was established between these princes and Miles Gloucester and his allies in the early 1140's. Similar agreements can be suggested between other Angevins and the Princes of Wales. In late January 1141 this force with Earl Ranulf of Chester marched towards Lincoln. On 2 February they crossed the Fossdyke, swollen large by the winter rains, and swept aside the few guards posted by the king so eager were the Angevins to do battle with the sovereign. King Stephen advanced down from the city heights to meet them, his army resplendent with the total force of six earls; Richmond, Norfolk, Southampton, Surrey and Worcester commanded the right wing of the king's army. The earl of York (sometimes known as Aumale) commanded the royal left. It was said of these earls who had gone into battle with their mounted knights that they had brought but a small armoured force with them, much less than was required and that their idea of warfare was chivalric tilting rather than the slaughter of a great battle. The earls themselves were regarded but little by Earl Robert of Gloucester. Before the battle began, in order to hearten his troops, he stood before them and raised their spirits with a speech. He called Duke Alan of Brittany and Richmond "an infamous man polluted with all kinds of crimes"; The earl of Worcester and Mellent he said was "slothful in deeds; presumptuous in heart; magnanimous in words; pusillanimous in acting; the last to attack, the first to run away; tardy in battle, swift in flight"; Earl Hugh of Norfolk he found only guilty of perjury in abandoning the Empress (obviously he thought he might revert to the Angevin cause); Earl William of York, one of the victors of the battle of the Standard but 3 years before, he found "a man of singular constancy in crime... whom his wife, taking to flight has abandoned by reason of his intolerable filthiness"; and worse with him came the earl of Surrey "who has taken away his wife from the last named earl, a most avowed adulterer; of singular impurity, a devotee of Bacchus; a stranger to Mars; wreaking with wine and unacquainted with warfare"; finally there was earl Simon of Southampton "whose deeds consist of words alone; whose only gifts are promises; who when he has said a thing, has done it; when he has promised, has given". Before the battle had commenced King Stephen had instructed one of his nobles, Baldwin, to give a speech to his troops as he "had not an agreeable voice". Baldwin considered that Earl Robert of Gloucester "threatened much and does but little, having the mouth of a lion and the heart of a hare, eloquent in words, and always in the background through his slothfulness". The earl of Chester he thought "a man of unreasonable boldness, ready for plotting, inconstant in performing, impetuous in warfare, unprovided against danger, contriving schemes too lofty for his reach, bent upon impossibilities and bringing with him few good soldiers; collecting a straggling multitude of strangers, there is no reason why he should be feared. For whatever he begins like a man he always leaves like a woman; since in all matters in which he has been concerned he has met with misfortune, either overcome in the encounter and running away, or if, on extraordinary occasions, victorious, sustaining greater loss than those overcome. The Welshmen whom he has brought with him are only objects for our contempt, opposing their unarmed rashness to the front of battle, devoid of skill and all knowledge of the art of war, like cattle running upon the hunting spears." It is noticeable how accurately Baldwin spoke on this matter. The Welsh contingent was easily overthrown by the opposing division of the royal army at Lincoln. The poor showing of the generally spear or knife armed Welsh infantry against armoured knights had been shown on more than one occasion. The battles of Lewes and Evesham in 1264 and 1265 also began with a slaughter of the Welsh who could not stand with their Montfortian allies in the battle line. The Scots spearmen learned a similar lesson at Falkirk in 1298 and later in the 1330's at Dupplin Moor and Halidon Hill. It is to the credit of the two Llywelyn's of Gwynedd that they generally avoided pitched battles, knowing as they did that their lightly armed troops could not match the heavily armoured might of the Normans. The battle at Painscastle in 1198 where Llywelyn ab Iorwerth's troops were slaughtered under the leadership of Prince Gwenwynwyn must have emphasised the point - 3 Norman casualties claimed against over 3,000 Welsh! Even before Baldwin had finished his speech of exhortation the disinherited Angevin knights charged the cavalry of the five earls who were soon put to flight, those who were not killed or captured. With nothing to loose and all to gain the 'proscribed' made a formidable fighting force. On the left Earl William Aumale of York and William Ypres charged and smashed the poorly armed Welsh division, but were themselves in turn routed by the well ordered military might of Earl Ranulf. Now only King Stephen remained with his dismounted knights and they were rapidly surrounded by the now overwhelming Angevin force. The royalist square was then assaulted on every side "just in the way that an attack is made upon a fortified place". What follows is a graphic account of the last stand. "Then might you have seen a dreadful aspect of battle, on every quarter around the king's troop fire flashing from the meeting of swords and helmets - a dreadful crash, a terrific clamour - at which the hills re-echoed, the city walls resounded. With horses spurred on, they charged the king's troop, slew some, wounded others, and dragging some away, made them prisoners. No rest, no breathing time was granted them, except in the quarter where stood that most valiant king, as the foe dreaded the incomparable force of his blows. The earl of Chester, on perceiving this, envying the king his glory, rushed upon him with all the weight of his armed men. Then was seen the might of the king, equal to a thunderbolt, slaying some with his immense battle-axe, and striking others down. Then arose the shouts afresh, all rushing against him and him against all. At length through the number of the blows, the king's battle-axe was broken asunder. Instantly, with his right hand, drawing his sword, well worthy of a king, he marvellously waged the combat, until the sword as well was broken asunder. On seeing this William Kahamnes, a most powerful knight, rushed upon the king, and seizing him by the helmet, cried with a loud voice, 'Hither, all of you come hither! I have taken the king!'" All flew to the spot and the king was taken. King Stephen, foaming at the mouth in his rage, finally recognising the inevitable surrendered to the earl of Gloucester. The rest of his division fought on with no hope of escape till all were killed or surrendered. In one short day all had been lost for the royalists. The two princes who had led their Welsh troops to the battle must now have retired to their homelands in central Wales where another fate was awaiting them. No doubt their household and warband had been badly wasted by casualties at the battle of Lincoln and this would have weakened their ability to oppose the royalist attack in the Marches. In 1142 Cadwgan and another brother, Hywel, were slain through the agency of Helias Say, the royalist lord of Clun and personal enemy of Miles Gloucester. Their great uncle, Hoeddlyw ap Cadwgan, also fell to Helias around the same time in battle near Montgomery. These acts marked the commencement of a 6 year campaign in Mid Wales against both the Angevins and their Welsh allies. 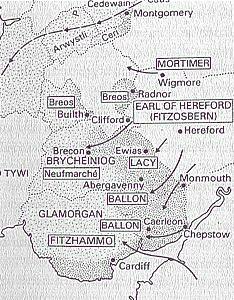 Its high point came in 1144 when Hugh Mortimer of Wigmore moved his forces towards Llandovery and Brecon. The cantref in which Llandovery castle stands was probably invaded during 1145 and its prince, Rhys ap Hywel, was defeated and captured by Mortimer. This triumph was followed in 1146 by the lord of Wigmore catching up with Maredudd ap Madog ab Idnerth and killing him and many of his household. In this manner did Hugh Mortimer gain vengeance against the enemies of King Stephen as well as extend his own frontiers against his personal enemies. The sons of Madog ab Idnerth were not all eliminated however and after Hugh Mortimer's defeat by the Angevins around 1148, the two surviving sons, Cadwallon and Einion Clud, became princes of Maelienydd and Elfael respectively. After Einion's death in late August 1177 Cadwallon achieved his heart's desire and became king of central Wales as a vassal of Henry II (1154-89) as his ancestor Llywelyn ap Cadwgan had done many years before. His glory unfortunately did not last long and on 22 September 1179 he was waylaid by the troops of the young Roger Mortimer, the son of Hugh, and killed to the great annoyance of Henry II!